We know a place where no cars go—Hamilton Island. Perfectly placed on the edge of the Great Barrier Reef among the 74 Whitsunday Islands, Hamilton Island affords visitors the opportunity to explore immaculate beaches and coral reefs unlike any other. As long as you’re willing to travel by foot or golf cart, that is since cars are prohibited on this tiny isle. Whether it’s a romantic getaway or an outdoor adventure that brings you here, the natural beauty of Hamilton Island is sure to dazzle. Hit the golf course and play among ocean breezes on neighboring Dent Island. Charter a boat and go island hopping and sail the sparkling waters of the Great Barrier Reef, or charter a kayak and circumnavigate the island at your own pace. Swim, snorkel, scuba dive, and surf—Hamilton Island is a true ocean playground. And once you’re done for the day, pull up a seat at one of the island’s many fine restaurants. Enjoy a fine glass of Australian wine, a meal of fresh seafood, and watch the spectacular sunset. The Whitsunday Islands have some of the most gorgeous beaches in the world—and Whitehaven Beach is one of the most popular, if not the best of them all. 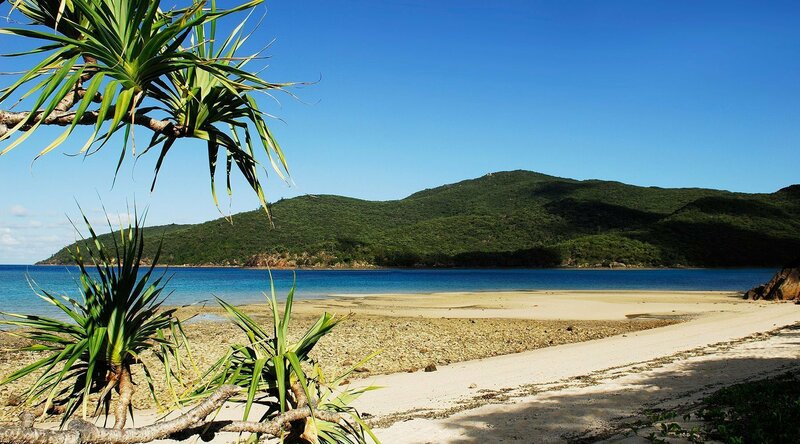 Its accolades include "the world's top eco-friendly beach, and Queensland's cleanest beach", and it's accessible by a variety of day trips from Hamilton Island. Take a quick day trip to see the spectacular Great Barrier Reef. The large protected area is home to numerous species of marine life and is the perfect place for snorkeling and diving. Keep your eyes peeled for migrating whales that are passing through the warm surrounding waters. Despite its name, this spectacular golf course is actually located on nearby Dent Island. Accessible only through an exclusive charter from Hamilton Island, this par-71, 18-hole championship course features views that are stunning enough to distract you from the game at hand. Boarding the ship's tender, you will be transported to Hamilton Island, to join your sailing vessel, the renowned On the Edge. One of the finest ways to fully appreciate the magnificence of the Whitsunday Islands is from the sea and as you travel through pristine waters dotted with lush green islands. Your 2 hour cruise will cross the Whitsunday Passage, passing a number of resorts and landmarks along the way. During the course of your tour, you will be provided with interesting commentary regarding the history of the Whitsunday Islands while being treated to afternoon tea and muffins onboard. Experience one of the seven wonders of the natural world. Set sail on an exclusive catamaran for a two-hour ride to the Great Barrier Reef where you'll board a large floating platform on the outer reef.